The Sedona dehydrator makes a great impression straight away with its ingenious simplicity – all you have to do is simply take the Sedona raw food dehydrator out of its packing, remove the foam padding, set it up and you are off. Everything is self-explanatory and there is no assembly work involved. The next thing you will notice will undoubtedly be the high-quality glass door – what is a failing on many other dehydrators fail has been addressed by the Sedona raw food dehydrator: So whenever you want to you can look through the door to see your food while it is being dehydrated, enabling you to observe the whole process from beginning to end. If you open the door during the dehydration process, the fan switches off to save electricity. And when you close the door again, the Sedona resumes the dehydration process automatically. Included in delivery with the Sedona raw food dehydrator is a set of nine slide-in trays complete with mesh drying screens – equating to a drying area of almost one square meter per tray! Sedona drying foil is available as an accessory. This is particularly useful for moist mixtures, from which you can make delicious linseed crisp bread or fruit leather. Once the dehydration process has been completed you simply pull them off the drying foil. Nothing sticks any more. What also distinguishes the Sedona dehydrator from other appliances is its digital system for measuring the temperature. At the start you have to set the temperature and the drying time you want. The Sedona then monitors the temperature over the entire course of the drying time and regulates it automatically to keep it at a constant level. When the drying time comes to an end, the Sedona switches off automatically as well – so you can never manage to forget your dried food! Whether it is set or not – the maximum drying time is 150 hours. After which the Sedona dehydrator switches off automatically. A horizontal air flow ensures that everything is dried evenly every time. You can put different ingredients on the separate trays without any worries. As soon as the first raw food delights have been dried, simply switch off that drying section and the Sedona will continue the drying process in the second section only. Where baking ovens have top heat and bottom heat, the Sedona dehydrator has drying air in just the top or the bottom drying section. And for drying food which is higher, you will find that the Sedona is no less impressive. All you have to do is remove some of the trays from the appliance and you can create space for vegetable kebabs or raw food pizza. Sedona raw food dehydrator: Psst… there’s drying going on here! 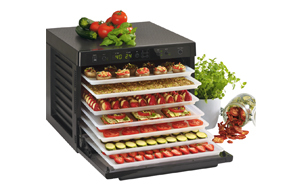 Finally, one other function you certainly won’t want to do without any more – the Sedona dehydrator can whisper! The Sedona dehydrator operates quietly even in normal mode, but for drying raw food during the night it also has an especially quiet night setting. The new Sedona raw food dehydrator is perfectly thought out right down to the last detail and is impressively simple, effective and versatile … for even more vital delights in your kitchen!